Tabitha Gilmore-Barnes is a professional weaver residing in Delaware County, New York. She studied at the Fashion Institute of Technology (FIT), and the Center for Tapestry Arts in New York City. Tabitha designs both functional and aesthetic products using traditional American patterns. Her work can be seen in museums and gallery exhibits, and at various arts and crafts fairs throughout the region. She has exhibited and sold her handwoven products at the following venues: Catskill Mountain Artisans Guild (Margaretville and Pakatakan Farmers Market), Erpf House-Catskill Center for Conservation and Development (Arkville), Middleburgh Artisans Cooperative, Roxbury Arts Group, Shaker Heritage Museum (Albany), Lefferts Farmhouse Historical Museum (Brooklyn), and Brooklyn Museum. I visited Tabitha’s studio in Roxbury on January 11, 2015. Simona David: Tabitha, please talk a little bit about the history of weaving. Tabitha Gilmore-Barnes: Weaving is one of the oldest forms of a blend of art and function. The techniques of twisting fibers to make them stronger and durable started out probably in the earliest times of mankind history. From those twisted fibers men and women wove reed baskets and textiles. For instance, in a lot of the Native American pottery from the South-Western U.S. and Central and South America you will see that twisted fibers have been pressed up against the clay to create a pattern on that clay. It’s been made as an impression on the clay to make it look as it was woven. In reality, it is a three-dimensional structure that was never plated or twisted in itself. During the Middle Ages guilds were set up in Europe that focused on the development and guidelines for designing and weaving tapestries as well as cloth for clothing and bedding. The recent tapestry exhibit of Pieter Coeke van Aelst at the Metropolitan Museum in New York City clarifies the time consuming detail process of weaving large tapestries, many of which depict stories of heroes from mythology and the Bible, and that only kings were wealthy enough to commission such works. On the Eastern coast of the U.S. it’s the Scottish, German and French immigrants who brought with them the knowledge, equipment, and weave patterns that were used to create fabric for everyday clothes and fancy bedlinens. For instance, a lot of the patterns classified and most readily preserved and recognized as Colonial American patterns were brought up by the Germans settling around Pennsylvania, while the Delhi Jacquard Coverlets featured at the Patterns that you may see at the Delaware County Historical Association in Delhi were designed and woven by the Scottish immigrants who settled in Delaware County or in Canada during the 1700s and early 1800s. With the Industrial Revolution, which included the development of water or steam powered looms in mills in England, Scotland, and Massachusetts, the time consuming and manual process of weaving one’s fabric for bedding and clothing died, and books of handwritten weave patterns gathered dust and were forgitten except in very rural parts of the Eastern US states, like Rhode Island, North Carolina, Tennessee. development of . Then in the 1930s and 1940s weaving was re-introduced to the farmers’ wives in South and North Carolina. It followed a period of renewed interest in weaving. A lot of the weaving in our area in the Catskills was done for family consumption, and was done predominantly by the women, perhaps both as a way to recapture before total loss our textile heritage and to provide income to families struggling economically during the Depression Era. SD: When was your first encounter with weaving, and what triggered this lifelong interest? TGB: I had a high school classmate who had left high school to go to another school – I believe in New Hampshire. And when she came back to visit, she talked about weaving. That really caught my imagination. Why? I don’t know. I come from a family that is in many ways artistically talented – painters, stained glass makers, writers, architects. I needed to craft out an artistic niche for myself, and that was weaving. Having a good color sense the textile arts have appealed to me. SD: And then you studied at the Fashion Institute of Technology in New York City. TGB: I attended the Fashion Institute of Technology from 1974 to 1976. I was an evening student. This was part of their Textile and Service Design Department. We were working on very small looms – 7 inch wide metal frame looms. These were difficult to work with. But weaving wasn’t a forgotten art. I liked the mathematical structure of setting up the loom. I fell in love with what it takes to create fabric. And when I mix the colors, when I mix the texture of the yarns together – to me that’s magical – how I get a piece of fabric: something out of nothing. SD: You’re also a spinner, and sometimes you buy wool, cotton, or other materials, and spin. Do you remember the first piece you ever made? TGB: A lot of the weaving we did at the Fashion Institute of Technology involved creating small samples in various patterns. The earliest samples I made I have probably either given them away or sold them. In the 1980s I went into business creating place mates, table runners, pillows, scarves, and I was selling them. SD: Would you like to talk about your evolution as a weaver, and discuss various guilds you belong to? TGB: I’ve always been involved in various groups, and here in the Catskills I’m involved with the Catskill Mountains Artisan Guild. 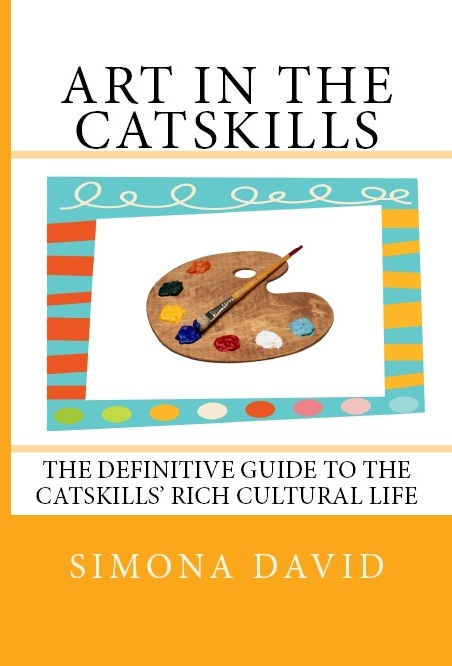 I joined the Catskill Mountains Guild in 2007. I believe I’m the only weaver in the Margaretville store. In the past I had also taken classes at the Center for Tapestry Arts in New York City – I believe that’s no longer in existence. One of the workshop leaders was Michelle Lester. She was a professional weaver – at FIT my best teacher was Nell Znamierowski, another professional in the textile industry. She was in the industry, and created samples for Pan Am Airways, for example. I was learning from professionals in the field, but a lot of the work that I do is also self-taught. SD: Let’s take a look at the loom you have here in the studio. TGB: The loom here in the studio is an AVL loom. It is a professional loom. It’s a 16 harness floor loom, and it’s a DOBBY loom. DOBBY refers to a particular way the threads are manipulated. The number of harnesses represents the trays on which there are heddles, and heddles are what supports the threads through a peg board system that activates the raising and lowering of harnesses. The harnesses and the DOBBY system manipulate what’s called the warp. It’s a vertical thread that goes from from the back beam on the loom through the heddles on the harnesses, then through the reed to be tied onto the front beam, which is where I sit to weave. The weft is on a shuttle, it goes to right angles to the warp, and that’s what I do as part of the weaving process. It’s a little complicated, and that’s why I enjoy when people come to my studio to get to see it. I’ve had this loom since 1990, and that’s how I do all my weaving. SD: How about your yarns? TGB: Cotton, wool, silk, linen. I do occasionally have non-natural fibers like acrylics. I prefer keeping it natural, because it gives me a business edge. The Jacquard Acid Dyes that I use with the wool that I do buy here in the County are environmentally friendly. I use a lot of water for a pound of wool to be dyed, less than a half of teaspoon of the dye powder, and about a ½ cup of vinegar – the vinegar being the acid. I come up with really bright colors. This past summer I got to work with plants like black walnut shells, golden rod, black-eyed-susan, indigo leaves – these are some of the colors used on wool: bright yellow, brownish-red, and also some blended colors. SD: Where do you buy your supplies from? TGB: All of the cotton that I have here in the studio I got through Webs – it’s a place in Northampton, Massachusetts – a factory size operation. They have tons of yarns available: wool, mohair, cottons. They have weaving supplies, they have crocheting and knitting supplies, they have books. It’s a wealth of supplies. The website is http://www.yarn.com. Also, much of the wool that I have here in the studio comes from an initial batch that I got years ago from someone who was selling out her yarns in Brooklyn. I also buy wool here in Delaware County from sheep and alpaca breeders. The Sheep and Wool Festival in Rhinebeck is also a great source – it takes place the third weekend in October. I only go there every four or five years when I have a full shopping list. SD: You’ve been featured in many magazines: Pure Catskills, Catskill Country, Greene Door magazine. Last summer you participated in the Open Studio Tour that has taken place last Sunday in July since 2012 in Andes, Margaretville and Roxbury area. Last year you were also the recipient of a NYSCA – DEC grant to work with students at the Roxbury Central School. Let’s talk about some of the coverage in the media, and also let’s talk about things that haven’t been covered. TGB: Pure Catskills Guide is published annually by the Watershed Agricultural Council in Walton. I’ve been a member since 2007. My products are listed under Value Added Farm Products. The next issue comes up in July. Lillian Browne wrote an article about fiber-related professions for the Catskill Country magazine fall / winter 2014 issue – that is published by Decker Publishing in Delhi. I was also featured in Greene Door magazine. In 2014 I received a grant from NYSCA – DEC program. I worked with Madalyn Warren from the Straight Out of the Ground farm, who also operates the Roxbury Central School’s garden. We worked with third grade students this past September, and we taught them how to work with botanicals to dye wool. The aim was to enhance their understanding of what Colonial American life was like. The farm families during the Colonial period were very self-sufficient. SD: Now let’s talk specifically about your work as a weaver. Let’s get closer to your loom. You’ve been working on this loom for the past twenty-five years. Please, demonstrate the weaving process. TGB: What I have now on the loom is a piece I’m working on – it’s a summer shawl. It’s a green mohair fiber – moss color is my dominant color. My accent colors are done in stripes: bright, clear yellow, and buttercup yellow. On the weft I have a dark green, a dark blue, and a very dark purple, mixed with a very thin gold thread. In the weft process I separate my warp into two layers. At right angles to the warp my weft is laid in between those two layers. It creates a net. In this particular case I want my rows of weft to be really close together so it’s a dense piece of fabric. The yellow thread gives you some sparkle; the dark blue and green colors help to highlight the moss green and yellow. SD: What is your primary drive in the process of weaving? TGB: The mix of colors and the textures of the yarns that I’m using. SD: Weavers have always woven both for functional and aesthetic purposes, going back to ancient times. You’re doing the same thing today. You are making fancy tapestry for purely aesthetic reasons, and you’re also making functional objects like scarves, blankets, and pillow covers. Let’s talk about the variety of products that you make. TGB: I came to weaving primarily to do functional things: place mates, table runners, covers for pillows. In the early 1990s I’ve also started to explore creative projects, and begun doing tapestry. I work on what I feel like, and what my inventory at the Catskill Mountains Artisan Guild needs. SD: To a certain extent you are a multi-media artist. You also do wood-block prints. You have a composition here done both as tapestry and wood-block print. I would assume it takes two completely different sets of skills. TGB: It does. This project started with a series of photographs taken at a stream nearby. I took a print making class at SUNY New Paltz. I carved, and mixed the colors, and achieved a three-dimensional quality by overlapping layers of colors. Wood-block printing is a very technical process. I was very pleased with how the colors came out, how the subtlety of the snow came out blueish rather than looking purple or grey. And then I translated that wood-block print into a tapestry. Again, overlapping the colors, and achieving the shadow effect which had to look realistic. That was a real challenge. It’s easy to make changes on wood-block by coloring it with crayons or ink, but it’s not so easy to make changes on tapestry. On tapestry, once you start weaving, if you need to make changes, you have to take everything out and start all over. TGB: I’m in the process of setting up a shop on Etsy at http://www.etsy.com/shop/TGBWEAVINGSTUDIO; I was encouraged to join Etsy by another textile artist with exceptional skills. It will be probably up by February. Soon I will be presenting again my Introduction to Weaving workshop at the Delaware County Historical Association in Delhi. I also have a weaving student who is creating a scarf. I am mentoring her. 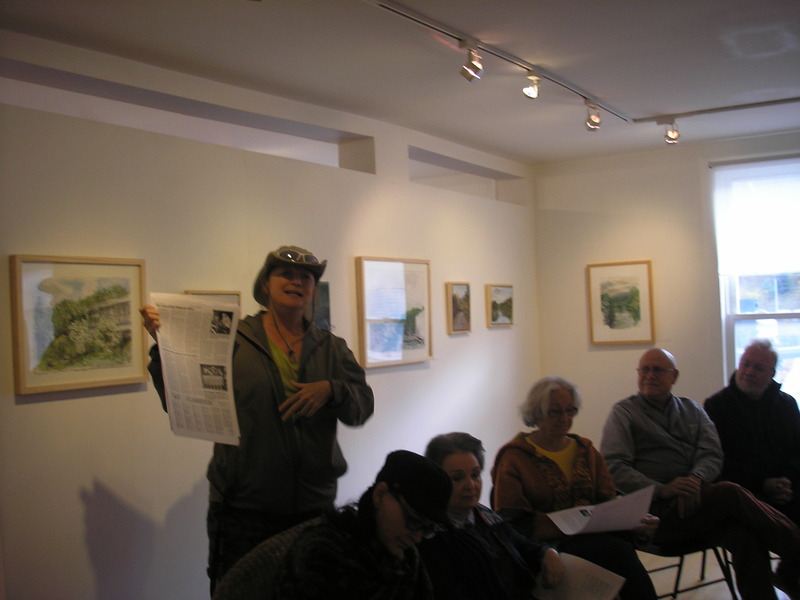 And we hope to have again the Andes-Margaretville-Roxbury Open Studio Tour this summer. SD: Are people today still interested in weaving, and if so, what exactly attracts them to this craft? TGB: I have the sense I may be one of the very few weavers here in Delaware County. There are some weavers in Narrowsburg and Port Jervis. 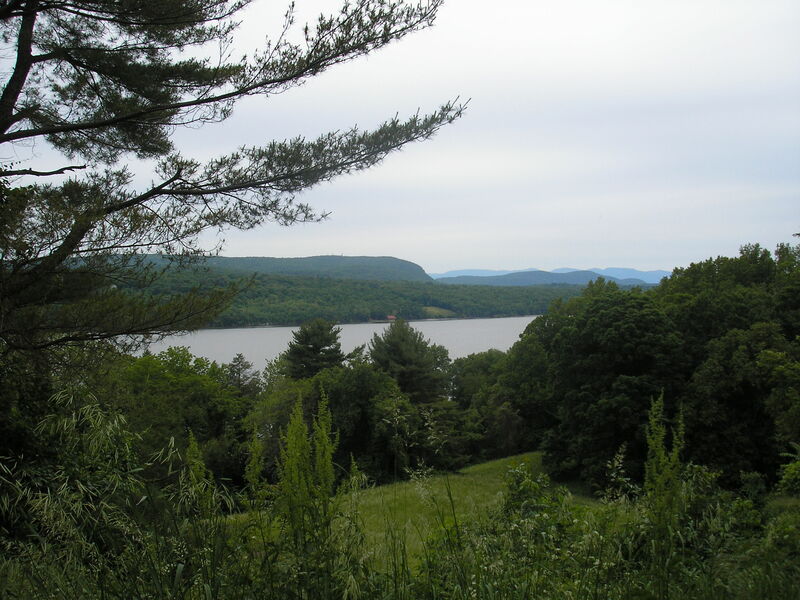 There are some docents who teach students who visit the Ashokan Field Campus in Ulster County. Also, the Farmers’ Museum in Cooperstown has a weaver and docents who demonstrate and discuss the textile arts of the Colonial American period. I think what keeps one from being a weaver is the size of the equipment. It’s also time-consuming: it could take up to eight hours to set up everything for a new project. SD: How does your schedule look like? TGB: I usually work on weekends. And that includes anything from planning a new project, bookkeeping, and marketing. I also have a scrapbook and a weaving notebook that I update, and write down new ideas. When I retire from my day job, I do plan this to become a full-time operation. SD: What do you like most about being a weaver, and what do you find most challenging? TGB: It’s a very satisfying craft, because I am making something. It is challenging, but the rewards are strong. SD: You are very active, and rather pragmatic for an artist. You also take care of the business side, you do social media, so forth and so on. How can people get in touch with you, and find more about what you do? TGB: I am on Facebook at facebook.com/tgbweavingstudio, and I blog at tabithagilmore-barnesstudio.blogspot.com. I’m also on Pinterest at pinterest.com/tgbweaving. I update my blog weekly, and I showcase what inspires me. To make appointments and visit the studio, call (607) 326-7662. Tabitha Gilmore-Barnes is a weaver, spinner and educator living and working in Delaware County. The Spring Season at Fischer Center at Bard College in Dutchess County begins this Saturday, January 31 at 8 p.m. with an Opera workshop called “Danger and Devotion,” staging operatic scenes from the 1600s to the 1900s. Students from the Bard College Opera Workshop will perform in the chorus and as soloists. Founded in 1860 in Annandale-on-Hudson, in Dutchess County, New York, Bard College has been a haven for writers, artists, intellectuals, and scientists since the mid-1930s, when many luminaries fled Europe and settled in New York. The college is an important cultural institution in the region, and includes the Hessel Museum of Contemporary Art, and the Richard B. Fisher Center for the Performing Arts. In addition, every summer Bard offers an eight week long arts festival – Bard SummerScape, which takes place in July and August, and a classical music festival – Bard Music Festival, which takes place in August. For full program, visit http://fishercenter.bard.edu/springevents/. Also, in Dutchess County the Frances Lehman Loeb Art Center at Vassar College is opening a new exhibit this Friday, January 30 – XL: Large-Scale Paintings from the Permanent Collection, on view through March 29. Founded in 1864, the Frances Lehman Loeb Art Center houses over 18,000 paintings, drawings, prints, photographs, sculptures, textiles, ceramics and glass wares from ancient times to the present. The collections include many European and American masters, such as Albrecht Durer, Rembrandt van Rijn, Pablo Picasso, and others. The Warburg Collection contains works by leading artists of the Hudson River School of Painting such as Frederic Edwin Church. Two new installations are also worth checking out: http://info.vassar.edu/news/announcements/2014-2015/150123-fllac-installations.html. For more information about Vassar’s Art Center, visit http://fllac.vassar.edu. Historic Huguenot Street in New Paltz, Ulster County, includes seven authentic historic stone houses built by Huguenot settlers fleeing Europe in the late 1600s – early 1700s. The seven existing homes were built between 1705 and 1799 in the Dutch rural architectural style – some of these households also include Federal elements. In addition to these homes, the Historic Huguenot Street includes a church, a research library, and an archive. The street, in its current state, was founded in 1894 by the descendents of the first settlers; it was designated a National Historic Landmark in 1960. Special events are organized year round. For more information, visit http://www.huguenotstreet.org. 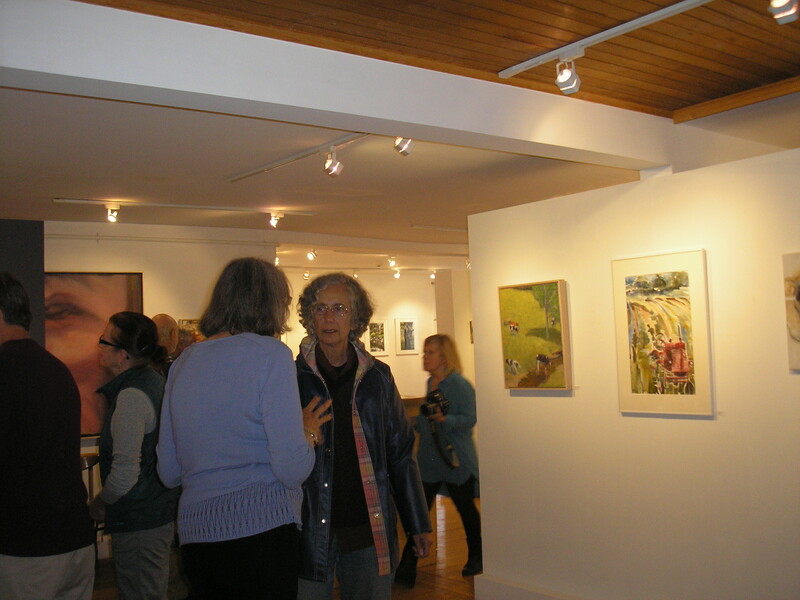 Arts Society of Kingston (ASK) in Ulster County was founded in 1995, and presents ten – twelve juried art shows each year. Workshops and other events are organized year round, including poetry readings, musicals, plays, and other performances. On view through January 31 there is a member exhibition called Interaction of Color, and a spotlight exhibit featuring paintings by Isaac Abrams inspired by Physics, Chemistry and Biology. The gallery is open Tuesday through Saturday from 1 to 6 p.m., and by appointment. 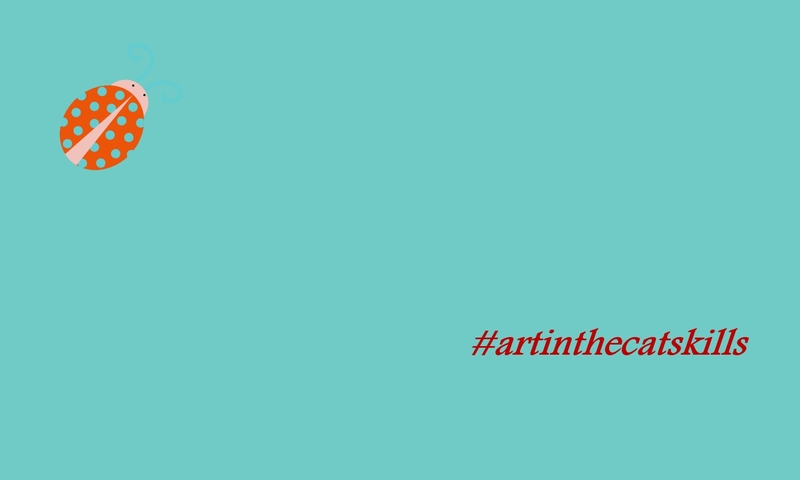 For more information, visit http://www.askforarts.org. Enjoy an artful Catskills weekend! This weekend in the Catskills – many art show openings, and performances. As usual, lots of things to do. Here are my recommendations. This Saturday, January 17 at 4 pm the Woodstock Byrdcliffe Guild is hosting an opening reception re:Member, an annual group show featuring works in various media by current members. The reception will take place at the Kleinert / James Center on Tinker Street. A Best in Show prize will be awarded. Following the reception there will be an open mic for artists to share their thoughts, as well as live music, poetry, and storytelling performances. The event is free and open to the public. For more information, visit http://www.woodstockguild.org/ai1ec_event/annual-members-show-re-member-opening-reception/. Longyear Gallery in Margaretville, Delaware County, is hosting an opening reception this Saturday, January 17 at 3 pm. This is a group show featuring artists affiliated with the gallery. Longyear is an artist-run cooperative founded in 2007, and featuring artists in all media and styles. Participating artists include Margaret Leveson, Ellen Wong, Helene Manzo, Ann Lee Fuller, Nat Thomas, and others. For more information, visit http://www.longyeargallery.org. Catskill Art Society in Livingston Manor, Sullivan County, is also hosting an opening reception this Saturday, January 17 at 3 pm; an Artist Talk will take place at 2 pm. Flux features three different artists whose works are linked by a common theme: nothing is constant but change. Claire Breidenbach, Christopher Manning, and Cathellen Parra will exhibit photography and installations that speak about evolution and change. The show will run through February 7. For more information, visit http://catskillartsociety.org/exhibits. The Arts Upstairs Gallery in Phoenicia, Ulster County is hosting a Potluck Party this Saturday, January 17 at 6 pm featuring a group show by its members, and also extending the solo exhibit of artist Anthony Margiotta. Margiotta recently received Honorable Mention and The People’s Choice award for his painting Prospect Park. Margiotta is also a member of the Woodstock Artists Association and Museum (WAAM). For more information about Arts Upstairs, visit http://www.artsupstairs.com/. The Center for Performing Arts at Rhinebeck in Dutchess County presents Sunday in the Park with George, a musical by Stephen Sondheim exploring the life and work of French Post-Impressionist painter Georges Seurat. The musical addresses questions such as what is art, and what is life? Performances are held Friday and Saturday at 8 pm, and Sunday at 3 pm. For more information, visit http://www.centerforperformingarts.org/all-shows-sp-1131460608/item/sunday-in-the-park-with-george. 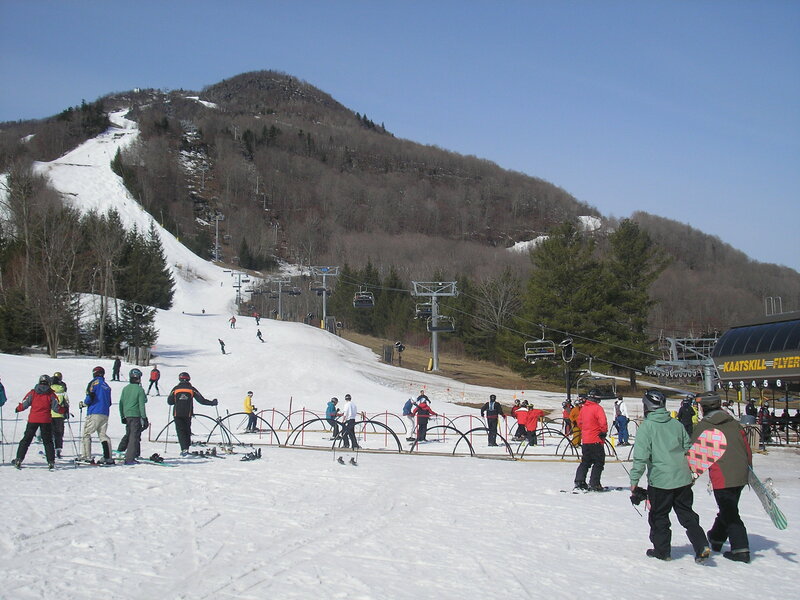 Enjoy an artful weekend in the Catskills, and check out the area’s ski resorts! It’s a frigid weekend in the Catskills with temperatures in the low teens. But perfect though for wandering through art galleries, attending storytelling events, or taking workshops. Art is uplifting. Dia:Beacon Gallery in Beacon, Dutchess County, is hosting a Community Day event this Saturday, January 10 from 11:30 am to 12:30 pm with a program dedicated to families with children. Titled “Imaginary Alphabets and Intentional Accidents,” the program includes playful exercises with works by Carl Andre, John Chamberlain, Sol LeWitt, and Richard Serra meant to engage children in fun and instructive activities. For more information, visit http://www.diaart.org. Glaring Omissions Writers Group in Woodstock, Ulster County, presents “Prose on Youth,” a reading event featuring writers Nanci Panuccio, Robert Burke Warren, Betty MacDonald, and Violet Snow. The event, hosted by the Golden Notebook Bookstore, takes place Sunday, January 11 at 4 pm. The four writers will be reading from their works which address a variety of themes: parent – child relationship, music, theater, and the relationship one has with his or her ancestors. For more information about this event, visit https://www.facebook.com/events/1508773069411593/?ref=3&ref_newsfeed_story_type=regular. Utopia Soundstage in Bearsville will be hosting “Every Summer Has a Story,” an event organized by Martha Frankel, the executive director of the Woodstock Writers Festival. This is a story slam competition; the winner will receive books, chocolate, and a spot at the Woodstock Writers Festival Story Slam event on March 19. For more information, visit http://storyslams.com/the-storytellers/. Fenimore Art Museum in Cooperstown, Otsego County, is hosting the Cabin Fever Film Series, an event co-sponsored by the National Baseball Museum and the Glimmerglass Opera Festival. This Friday, January 9 at 6:30 pm there will be a screening of the West Side Story in the museum’s auditorium. This is the 11th edition of the Cabin Fever Film Series. For more information, visit http://baseballhall.org/node/3582.